يوفر Artisan Spa Views البوتيكي المخصص للبالغين فقط أجنحة ضيوف من 3 المبيت والإفطار ومنزل ريفي ذاتي الخدمة مكون من غرفتي نوم مع إطلالات على الجبل والوادي. تحتوي جميع أجنحة الضيوف في B&B على حوض سبا كبير وشرفة خاصة. يحتوي المنزل الريفي على جاكوزي داخلي وشرفة كبيرة. يقع Artisan Spa Views على مشارف مدينة ماليني في المناطق النائية في صن شاين كوست، وهو قاعدة مثالية لاستكشاف المتنزهات الوطنية القريبة. تقع حديقة حيوان أستراليا على بعد 25 دقيقة بالسيارة. توفر جميع الغرف في Artisan Spa Views إطلالات خلابة وتلفزيون وأفلام مجانية وخدمة الواي فاي المجانية وتكييف وتدفئة. يتم توصيل وجبة إفطار ساخنة مجانية إلى أجنحة الضيوف، في حين أن المنزل الريفي ذاتي الخدمة بالكامل مع مطبخ ومرافق للشواء. سيطلب من الضيوف عند تسجيل الوصول إظهار بطاقة هوية تحتوي على صورة شخصية وبطاقة ائتمان. يرجى ملاحظة أن جميع الطلبات الخاصة ستكون رهنًا بالتوافر وقد تستلزم تكاليف إضافية. يرجى إبلاغ Artisan Spa Views بشكل مسبق بوقت وصولك المتوقع. بإمكانك استخدام حقل الطلبات الخاصة أثناء عملية الحجز أو يمكنك التواصل مع مكان الإقامة مباشرةًً من خلال معلومات التواصل المذكورة في تأكيد الحجز. لا يستضيف مكان الإقامة حفلات توديع العزوبية للرجال فقط أو النساء فقط أو الحفلات المشابهة. I loved staying at Artisan Spa Views. The suite was lush, very clean and spacious with an amazing view. The breakfasts were so delicious but the best thing were the hosts: Andrew and Catherine. They went above and beyond and made my stay so pleasant. Wouldn't hesitate to stay there again! AMAZING. We loved it. We are now rejuvenated and felt most at home over the weekend. Teh staff were fabulous. Excellent place to relax for a few days before starting the work year! Fabulous! The room was large, comfortable and very relaxing. A lovely mid week stay in accommodation that was 'boutique' in the sense that it had only a few rooms (two king suites and the honeymoon suite) and one separate(one and/or two bedroom) set of accommodation. Therefore quiet and personalised service. A lovely cooked breakfast on a trolley was wheeled in each morning versus a tray which gave a nice touch. Aromatherapy bathroom products. Magnificient views including grazing donkeys and fabulous wildlife including flocks of yellow-tailed black cockatoos regularly flying by. Will be staying there again. Love the cottage we stayed in. Had own jacuzzi in the room, fully equipped kitchen and all you need to bring is your clothes. Towels,soaps etc all provided. Had lotsa movies for you to enjoy. Real far from the beach area but great for honeymooners. Stay in the cottage, enjoy jacuzzi and cuddle while watching movies. Highly recommended! Friendly owners, great breakfast, nice views, immaculate room. 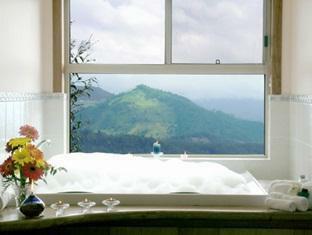 We had high expectations of Spa Views after reading all of the reviews on Trip Advisor. We booked the honeymoon suite for two nights and ordered a cheese platter for our arrival. the experience was difficult to fault. Randy and his partner were friendly and helpful. They were keen to make our stay as enjoyable as possible. They booked a seating at Maudy's across the road for us and recommended some dishes. The room itself was immaculate with good attention to detail. There were little chocolates on the bedside tables. There was an abundance of towels conveniently placed in the room and next to the spa. That brings me to the spa itself. It was the highlight of the room for us. We spent a few hours in there over the course of our stay. It is huge and comfortable with a great view. Breakfast was substantial, well prepared and delivered on time both days. While we enjoyed the stay, there were some things we thought which could have been done a little better. We did, after all, book the honeymoon suite. We were left wondering what we received for those extra dollars. Perhaps the cheese platter could be made free for guests staying in the premium accommodation, or a bottle of champagne provided complimentary.